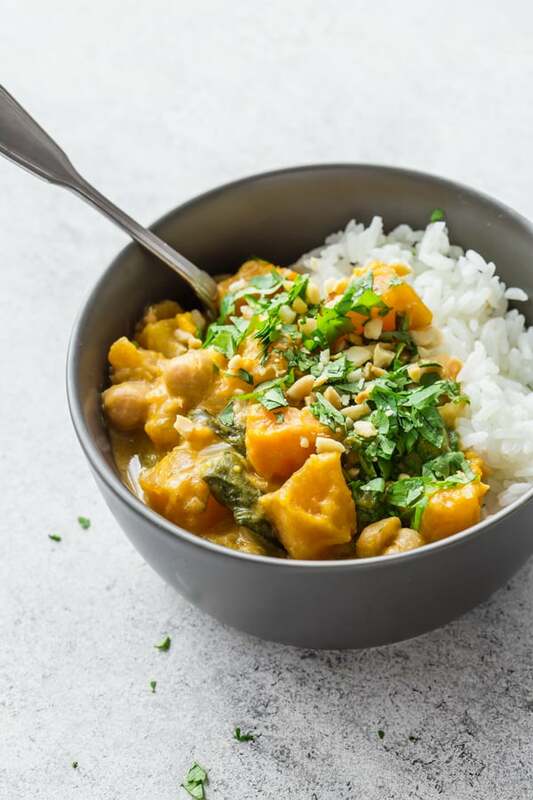 This slow cooker chickpea pumpkin curry is a simple and healthy recipe that comes together like magic in your slow cooker. Serve it on top of rice or quinoa or a warming and filling dinner! This week was the first time I took out my slow cooker all year. It’s been sitting in storage and collecting dust while I’ve been focusing on vibrant summery recipes. 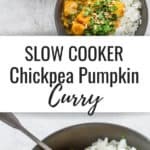 But with Fall literally just around the corner, I figured it was time to show my slow cooker some love! To be honest I actually forgot just how much I love my slow cooker. And to continue on the honesty train, I don’t use it nearly as much as I should. 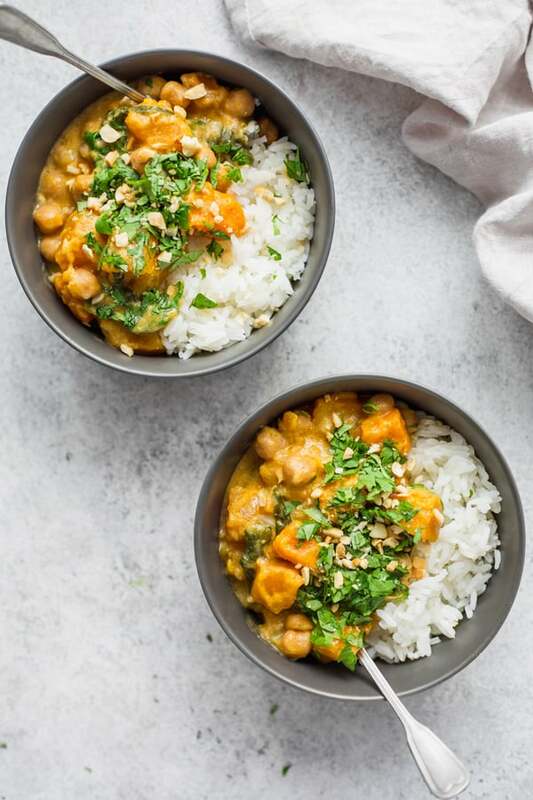 I think I used it a total of one time last Fall season to make this crockpot Moroccan chickpea stew, and then stuck it away in storage and forgot about it. (Sorry baby, I’ll never do that again!) 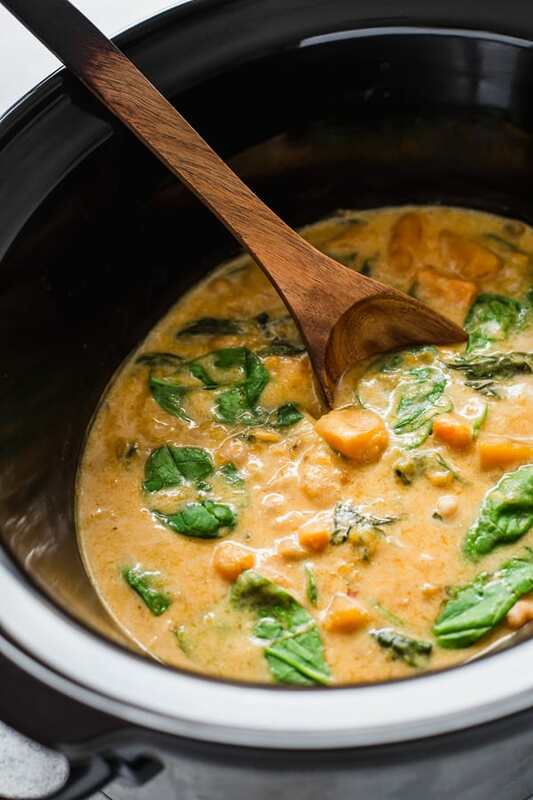 I’m not totally sure why because after making this slow cooker chickpea pumpkin curry and realizing how much I loveeeee not having to cook dinner, right before dinner, my life is officially changed. The slow cooker not only makes delicious food, but it helps free up so much time, and gives you the freedom to prepare your dinner hours in advance, when you may have more time on your hands. I prepare this curry in the morning while I’m brewing my morning coffee, turn it on for 8 hours, and then go about my day. Simple as that! 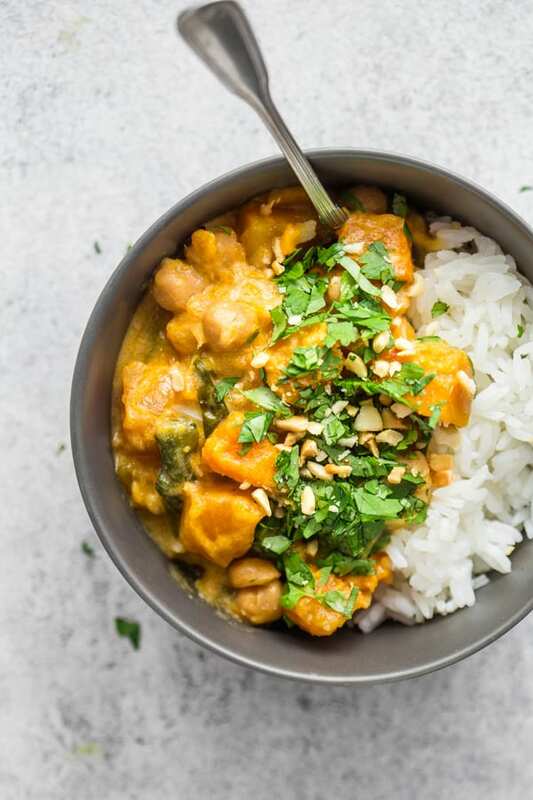 This curry can be prepared with basically any type of pumpkin or squash. Butternut squash, delicata squash or any others will work well. 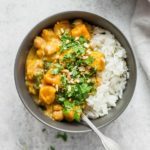 I love the addition of sweet potato to this recipe to give an additional texture and flavour, but you can always just substitute it for some more squash. You can either prepare this dish in your slow cooker on low for 8 hours, or on high for 4 hours. I like to put mine on for 8 hours and prepare it in the morning. Although you can add the onions and garlic directly to the slow cooker without sautéing them first, I HIGHLY recommend you sauté before adding them in! There is no replacement for the flavour you get from sautéed onions and garlic. This step takes a total of 5 minutes but will give the dish some incredible flavour. This curry practically cooks itself in a slow cooker! 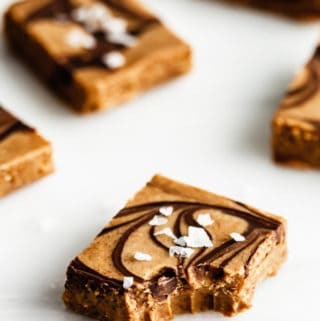 You’ll love how quick and easy it is to make! Heat the oil in a pan on medium-high heat, then add the onions and saute for 2-3 minutes. Lower the heat to medium and add the garlic, letting cook for another 2 minutes. Remove from the heat. Add the vegetable broth, coconut milk, red curry paste, soy sauce, coconut sugar to the slow cooker and mix until combined. Next add the onions & garlic, pumpkin, sweet potato and chickpeas mixing everything together. 10 minutes before serving, add in the spinach and mix into the curry. Cover and let cook for 10 minutes. 1 1/2 tbsp of soy sauce was about enough for me, but I additionally added a little bit of salt and pepper to the final dish. Saltiness will vary depending on the brand of both & soy sauce you use, so taste and adjust to your liking. Don’t skip out on the crushed peanuts! They add a great layer of flavour and texture to the curry. 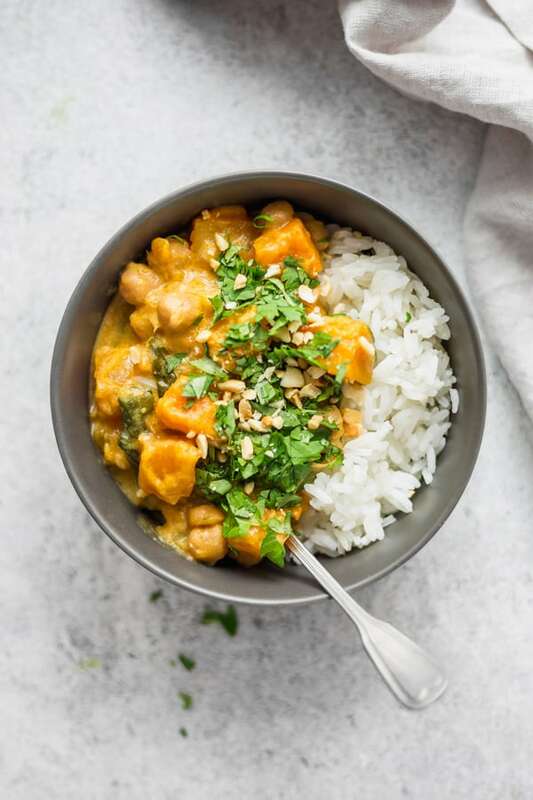 This pumpkin curry looks so creamy and delicious! I love that you can make it in a slow cooker. 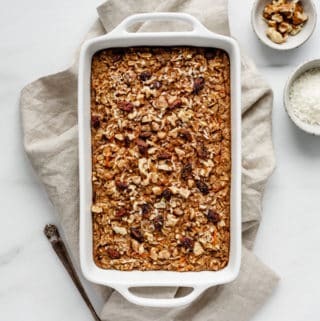 I loved this – so simple so easy and SO good!! I don’t like onions so I skipped putting them in and was still lovely. First-go my dinner guests nor myself missed having meat with our meal but with some chicken in the fridge, I made it a second time adding chicken super yum too! Thank you so much Jessie! So happy you enjoyed the recipe. 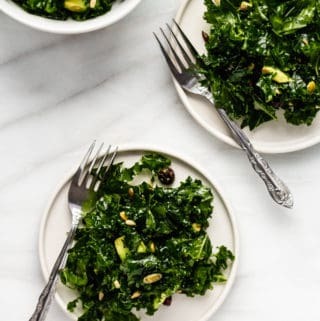 It makes for a great meatless dinner but I imagine the same dish with chicken in it would also be delicious! Super simple and very tasty! Looking forward to making more curry dishes after seeing how easy and delicious this one was!! 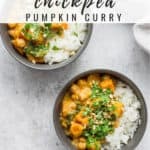 Hi, This I’m wondering if I can make this with dried chickpeas instead or what the changes would need to be. 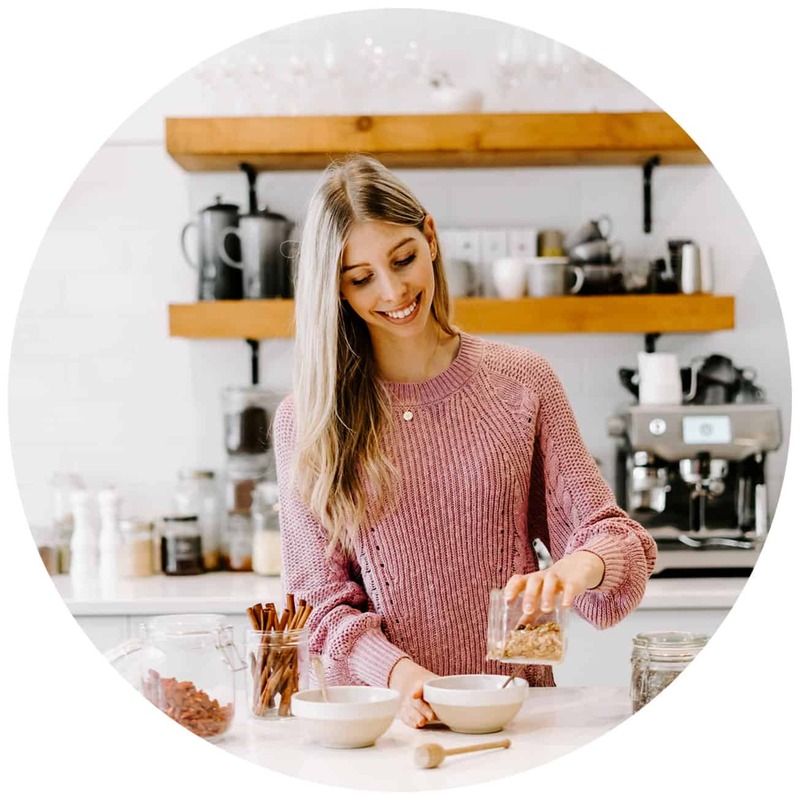 Hi Aimee, I haven’t tested this out with dried chickpeas, however if you had dried chickpeas to the slow cooker they will definitely absorb a lot of the liquid. So for this I’d recommend pre-cooking your dried chickpeas and then adding them to the slow cooker! This is delicious. I used dried chickpeas, soaked and cooked before adding. Thank you for the review Anna! So happy to hear you enjoyed the recipe!